Nationwide locations, TGI Friday's is a casual chain restaurant with a festive vibe serving beer, cocktails & a wide menu of American fare. loaded with cheddar cheese and bacon, served with sour cream & chives. carmelized onions, peppers and cheese. Served with avacado ranch dressing and pico de gallo. potato skins, fried mozzarella and buffalo wings, served with sour cream, chives, bleu cheese dressing and marinara. breaded and fried, topped with spicy buffalo wing sauce. Served with bleu cheese and celery sticks. parmesan and romano cheeses blended with spinach and artichokes, served with warm tortilla chips. crispy, fried chicken breast strips with toasted sesame seeds, served with Friday's jack daniels sauce. served with bleu cheese dressing and celery sticks. jack ribs, shrimp and sesame jack chicken, served with jack daniel's glaze. fire-grilled dumplings stuffed with minced chicken and vegetables. Served with pico de gallo and szechwan. Chinese pork dumplings steamed, then pan-fried and served with szechwan dipping sauce. sauteed shrimp, chicken, red bell peppers and green onions tossed in a cajun alfredo sauce. Friday's fettuccine alfredo topped with blackened chicken breast, garnished with tomatoes and green onions. portabella mushroom marinated and grilled with asparagus, roma tomatoes, red pepper, zuchini & squash, served with angel hair pasta and topped with roma tomato-basil salsa. fresh roma tomato-basil salsa tossed with angel hair pasta and grilled chicken. 6 strips of cod filet, hand battered and fried golden. Served with fries and tarter sauce. 12 hand battered shrimp served with fries and cocktail sauce. a roasted mild whitefish topped with a roma tomato-basil salsa and drizzled with a balsamic glaze. Served with steamed herbed rice and broccoli. chilled fire-grilled citrus chicken breast served over crisp shredded greens tossed with fresh low-fat cilantro-lime dressing. Mandarin oranges and diced tomato. crisp romaine lettuce, tossed with caesar dressing and topped with our grilled chicken, fresh shaved parmesan, and croutons. pecan encrusted chicken breast served chilled and sliced on salad greens tossed with mandarin oranges, sweet glazed pecans, dried cranberries, crumbled bleu cheese and balsamic vinaigrette dressing. mixed greens tossed in a spicy chipotle ranch dressing, topped with grilled chicken, tomatoes, black bean and corn salsa and grilled red onions. ham, mesquite-smoked Turkey, cheese, bacon, lettuce tomato and mayo on wheatnut bread. served on warm ciabatta bread with melted cheddar cheese, lettuce, tomato and mayo. grilled breast of chicken on a sesame seed bun with melted monterey jack cheese, crispy bacon and our signature sweet-smoky mayo. handbattered fried chicken tenderloins on toasted ciabatta bread, loaded with melted monterey jack cheese, and crispy bacon, lettuce, tomato, and mayo. smoked pulled pork tossed with barbeque sauce and basted with our jack daniel's glaze. Topped with grilled onion and served with fries. made with whole grains, cheeses and mushrooms, served with lite peppercorn ranch and a house salad. melted American cheese, crispy bacon and gooey, golden fried provolone cheese. a full slab of baby back pork ribs, served with fries. two juicy chicken breasts served with vegetables and mashed potatoes. a juicy chicken breast and 6 lightly battered shrimp served with vegetables and mashed potatoes. a dozen lightly battered shrimp served with jack daniel's glaze, vegetables and fries. a full rack of jack daniel's ribs and 6 lightly battered shrimp. Served with fries. choose from original or cajun. Served with fries and honey mustard. two marinated sauteed chicken breasts over onions and peppers with melted American & Mexican cheeses. Served with our signature mashed potatoes. juicy chargrilled barbeque-glazed chicken breast with a side of jack daniel's glaze. Served with black bean and corn salsa, herbed rice, grilled vegetables and steamed broccoli. sauteed garlic-marinated chicken breast with onions and peppers with zesty shrimp in a roma tomato-basil salsa. Served with mashed potatoes and American and Mexican cheeses. all steaks are served with one choice of the following broccoli, creamed spinach, roasted parmesan potatoes, cheddar mashed potatoes or cajun corn. a full slab of tender pork ribs, marinated and seasoned, then chargrilled and basted with barbeque sauce. Served with fries. our famous ribs glazed with our jack daniel's sauce and barbeque sauce. Served with fries. chipotle marinated chicken, mixed cheeses, carmelized onions & peppers in double-stacked tortillas. Served with ranchero rice, fresh pico de gallo, sour cream, guacamole ad salsa. topped with cheddar cheese & jalapeno ranch dressing. parmesan and romano cheeses blended with spinach, artichokes, sauteed onions: served with fresh vegetables. 12 oz. strip steak served with a side of vegetables. served over onions and peppers with melted American and Mexican cheeses, served with vegetables. skewers of seasoned chargrilled shrimp topped with a sparkling citrus splasha nd served with vegetables. grilled chicken breast topped with salsa verde, pico de gallo and melted jack cheese, served with a low-carb sour cream and vegetable enchilada. warm brownie, covered in chocolate fudge, vanilla ice cream, caramel and pecans. two giant oreo cookies sandwiched with vanilla ice cream, caramel and fudge sauce. baked light in a vanilla graham cracker crust, layered with white chocolate mousse, fresh whipped cream, white chocolate shavings and a fresh strawberry. cinnamon-swirl cheesecake drizzled with sweet cream cheese. a delicious reduced-carb version of the smooth and creamy classic with whipped cream and toasted almonds. three rich layers of moist chocolate cake and sweet chocolate-fudge icing drizzed with caramel sauce. Search for deals and coupons from TGI Fridays and over 100,000 other retail stores, gas stations & restaurants inside The Coupons App. Explore exclusive shopping and restaurant offers at thousands of nationwide and local chains. Browse our best coupons, free samples, view local deals or see popular retail stores. Get alerts when we offer hot new savings at TGI Fridays and all your favorite restaurants & stores. Get automatic notifications when TGI Fridays deals are nearby. Save coupons for viewing anytime, anywhere. 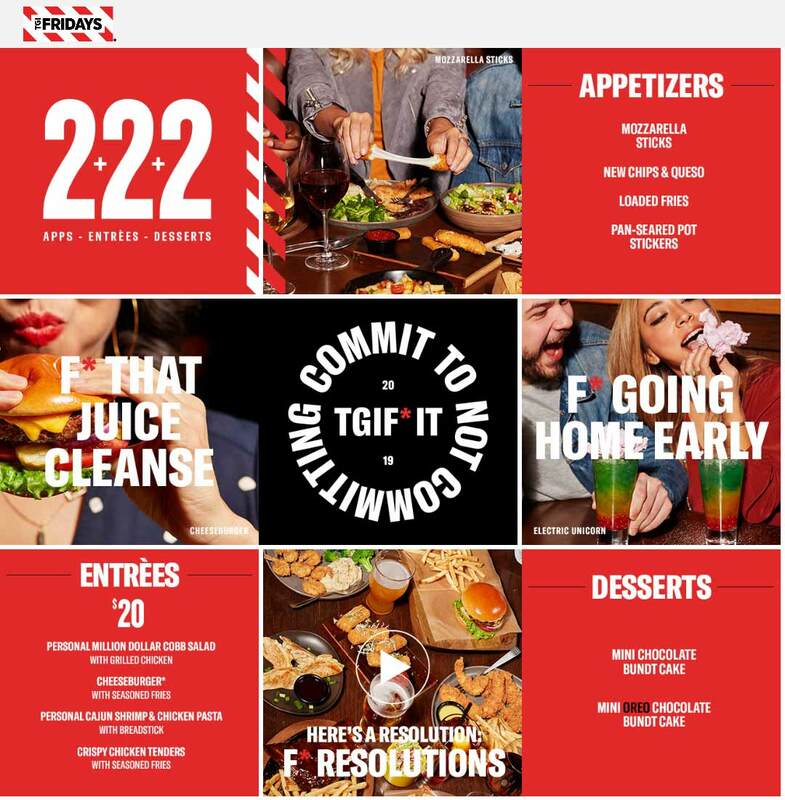 Get calendar reminders when your saved TGI Fridays coupons are about to expire. Win fantastic giveaways from our weekly contests!